Hillary Clinton, Ban Ki Moon and Eamon Gilmore have been among those reacting to the death of Muammar Gaddafi in Sirte today. 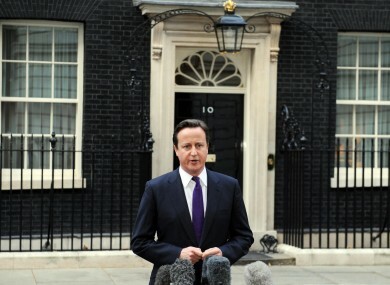 British PM David Cameron speaking to the media outside Downing Street today. WITH THE DEATH of Colonel Muammar Gaddafi confirmed by Libyan authorities this afternoon, world leaders and others have been reacting to his demise with a mix of caution and delight. As news of his death filtered through earlier today, leaders outside of Libya were cautious to pass comment given that it was initially reported the fugitive Gaddafi had been captured before it was eventually confirmed he was in fact dead. Tánaiste and Minister for Foreign Affairs Eamon Gilmore has released a statement this evening reacting only to the “reports” of Gaddafi’s death saying if true it has brought to an end “a sad and bloody chapter in Libya’s history”. UN Secretary General Ban Ki Moon said the death of Gaddafi was “only the end of the beginning” according to BBC News, adding: “Now is the time for all Libyans to come together”. In reacting to the death, British Prime Minister David Cameron said it was not a day to be triumphant but rather to “to remember all of Gaddafi’s victims” referring particularly the 270 people killed in the 1988 Pan Am bombing over Lockerbie in Scotland. Families of those who died in the Lockerbie bombing said the world is a better and safer place without Gaddafi. Susan Cohen, who lost her 20-year-old daughter, Theodora, at Lockerbie said she’s buying a bottle of expensive champagne to celebrate. While speaking to Sky News, Jim Swire, whose daughter Flora died at Lockerbie, expressed regret that there had not been a chance for Gaddafi to appear before the International Criminal Court at the Hague where he had been wanted for war crimes. Russia’s presidential envoy to Libya warned that Gaddafi’s death may not end the fighting in Libya. Secretary of State Hillary Clinton did not make any official comment on the death but the moments she learned of reports of Gaddafi’s capture were caught by US television where she is heard saying: “Wow…huh…unconfirmed”. Email “"Wow...huh...": how the world reacted to Gaddafi's death ”. Feedback on “"Wow...huh...": how the world reacted to Gaddafi's death ”.